The Short Version: An RV vacation is unlike any other because it’s an entirely custom trip — eat when you want, sleep when you want, and accelerate or decelerate your itinerary based on how you’re feeling that day. With a fleet of custom-designed, well-built, and well-maintained RVs, CanaDream can make your Canadian adventure a truly memorable experience. The company also helps with trip planning, so you’re sure to make the most of your excursion. Look no further than the site’s blog to create your own signature outing. With a 98% approval rating from guests, CanaDream is sure to make your romantic getaway dreams come true. Being present is one of the keys to experiencing happiness in life, even when you’re on vacation. In her article “Being Present in Travel: 6 Reasons Why, 4 Ways How,” Audrey Scott explores this concept. The first reason is pretty self-explanatory. We go on vacation to get away, not to have more of the same just in a different location. We unplug and remove ourselves from the stressors of everyday life, or at least that’s the idea. When we’re present in our vacation, we’re slowing down, enjoying activities, and making lasting memories. Another reason to be present on vacation, Audrey said, is to form deeper connections with people and places. When away from the busyness of life, we can slow down and truly bond with others, have meaningful conversations, and listen with our bodies and minds. To commune with your sweetheart, nature, and yourself, you need to slow your pace and enjoy your surroundings. 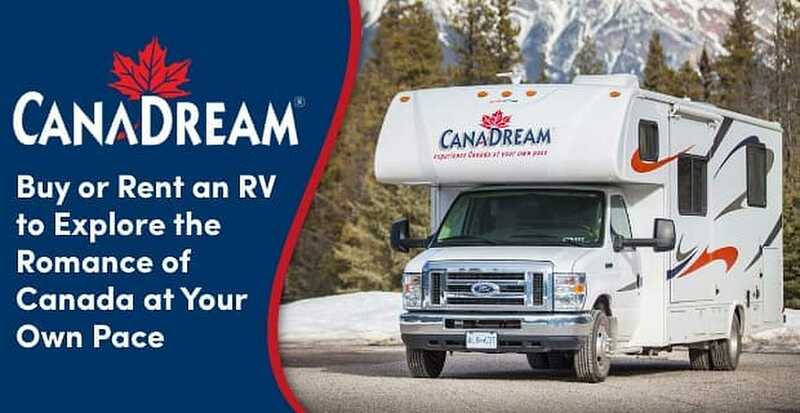 When visiting Canada, one of the best ways to do that is to plan a unique RV vacation with CanaDream, which offers guests the comforts of home and complete flexibility during their vacation. With a fleet of 800 RVs, CanaDream helps over 20,000 people a year experience Canada in exceptional comfort. The RVs’ beds will give you a good night’s sleep, and they’re also self-contained, which means you don’t have to hook up to city water or external power. Instead of packing and unpacking suitcases as you move through your Canadian trek — unpack, settle in, and enjoy your trip with fewer hassles and more togetherness in a cozy RV that allows you to control your schedule. Shirley told us Canada is a popular travel destination, which is why more than 70% of their customers are from outside the country. However, when you’re new to the Great White North, it can be hard to choose what to see because you have so many options. That’s why CanaDream’s trip planning resources offer more than 20 preplanned itineraries to inspire you and your partner. For example, if you’re planning on visiting Central Canada, just check out the Central Canada page. There are nine tour recommendations for Central Canada alone, focusing on things like the coast, fall foliage, and canoe routes. If the weather is right, consider the Eight-Day Quebec Ski Tour. It takes you through Mont Tremblant, Quebec City, and Montmorency Falls, among other places. Each itinerary also gives you tips for timing specific activities. CanaDream makes sure there’s a little bit of something for everyone. CanaDream’s blog has a lot of great advice as well if you’re not sure where to start. Here, you’ll find insider knowledge about places to see and other RV-related information to make your trip as stress-free as possible. Planning to see Canada in the off-season? “Why a Winter Ski Vacation in an RV Makes Sense” provides several insights into the experience in the colder months — including attractions you won’t want to miss and five-star restaurants for when you don’t feel like cooking. If you’re planning to visit Canada in the summer, check out the article “Vancouver RV Parks Provide an Ideal Mix of City Meets Country.” You’ll learn about must-do activities, such as whale watching, and RV parking availabilities and costs. The CanaDream team is happy to say that they have a 98% approval rating and receive heartwarming testimonials all the time. Couples celebrating their honeymoons, families getting a bit of quality time, and others who just enjoyed strumming their guitars under the stars fill the Happy Camper section. Graham and Linda-Anne came all the way from Scotland to spend their anniversary on a CanaDream adventure. “Great home for 10 nights around the Rockies. Awesome scenery, bears, elk, goats, eagles. Fab holiday for celebrating 30 years of marriage. Thank you!” they wrote to the team. When you peruse the testimonials praising CanaDream, the common thread is satisfaction with the staff.